indefinite article: Going, going, gone – the final spiral of a cultural icon? Going, going, gone – the final spiral of a cultural icon? Despite its fragmented nature, the Powerhouse Museum was a great design museum precisely because it was also a museum of science and technology – and a museum of social history, which could place it all in a historical and social context. In many ways design is a central part of the vocabulary of our time and integrally related to so many powerful social and economic forces – creative industries, popular culture, the digital transformation of society. The current travails of the internationally renowned Powerhouse are a measure of a lack of strategic vision, including from successive governments which have never properly grasped the power of culture in shaping society and the need for the long-term substantial commitment to enable it. The Powerhouse continues to play a crucial role in the area of creative industries, especially design. Yet no-one seems to know about it. 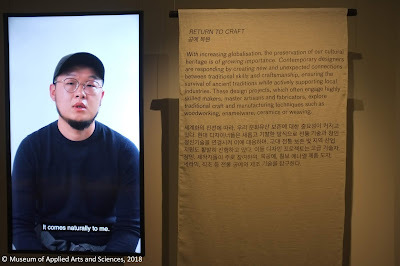 Where will exhibitions of this relevance and calibre be exhibited and, more importantly, developed, once these short-sighted changes have become real? Who would have known? I thought there weren't many exhibitions of note on in Sydney during a recent visit because I'd seen no publicity. I searched online and discovered that in fact there was nothing on at the Art Gallery of New South Wales. I was shocked, though, to find that the Powerhouse Museum had a major mens fashion exhibition from the Los Angeles County Museum of Art. 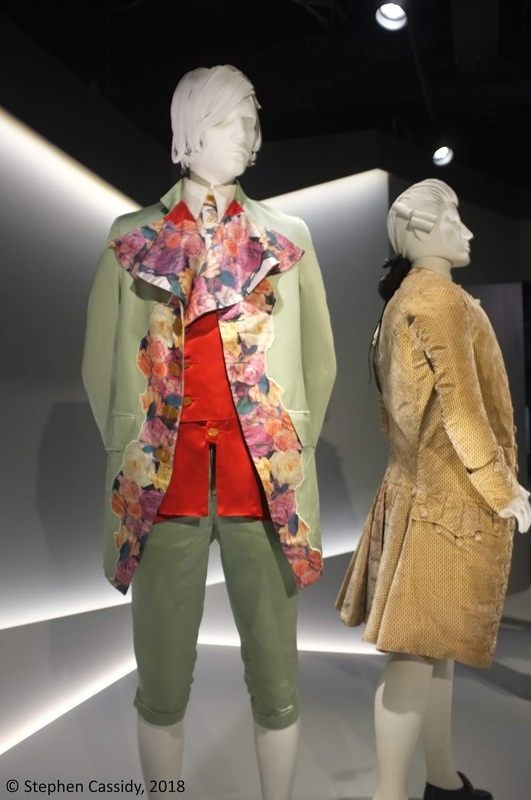 Costumes from the Reigning men: Fashion in menswear 1715-2015 exhibition. 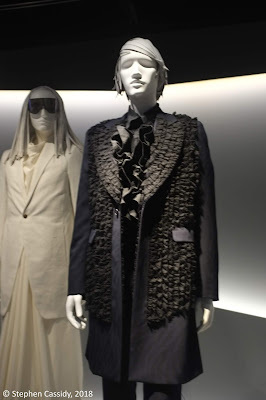 It features over 130 garments by a wide range of well-known menswear designers, including Alexander McQueen, Burberry, Calvin Klein, Chanel, Giorgio Armani, Gucci, Jean Paul Gaultier, Louis Vuitton and Yves Saint Laurent. Mens fashion waistcoats - then and now. In a very busy schedule I managed to slip in a visit to the exhibition. It was definitely essential viewing. On at the same time was a much smaller exhibition, with a small catalogue, but possibly one of the most profoundly interesting exhibitions I have seen. Common Good is an exhibition of work by designers from Australia and Asia that shows the vast range of ways design can be used to solve problems. It ranges from design used for environmental to industrial to community cultural development purposes. Panel from the Common Good exhibition on the many and varied uses of design in the Asia-Pacific region. 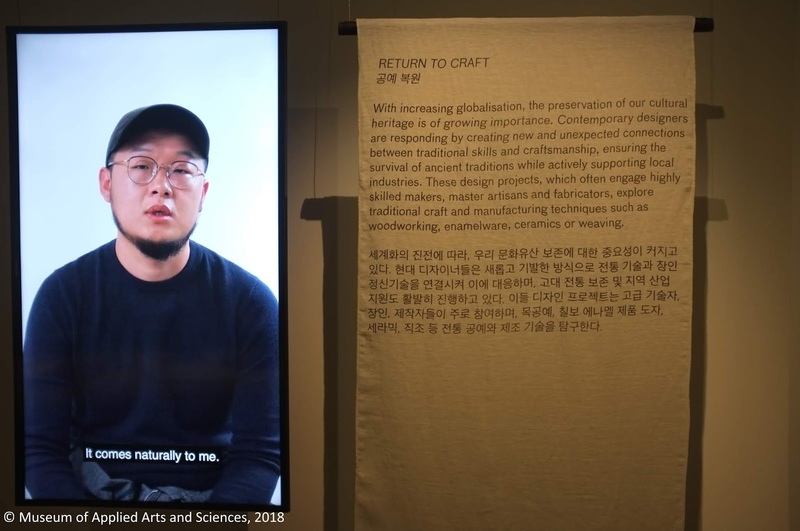 According to the accompanying notes, the exhibition is 'a survey of contemporary design from the Asia-Pacific region that explores design-led responses to social, ethical and environmental challenges by a new generation of socially-engaged designers. Diminishing natural resources, population pressure and the preservation of our cultural heritage are among the issues explored.' It was launched as part of Sydney Design Festival 2018. 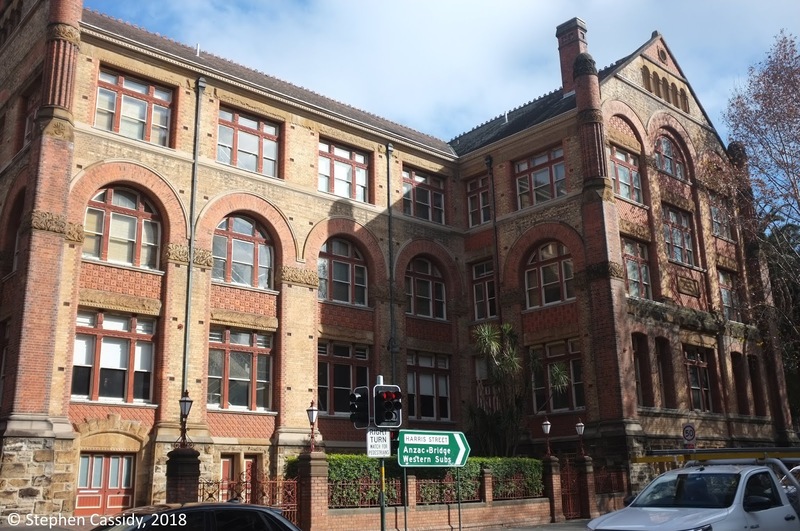 Birth of a vision - the original Museum of Applied Arts and Sciences in Ultimo. Despite its current trials the Powerhouse continues to play a crucial role in the area of creative industries, especially design. Yet no-one seems to know about it. Has the marketing budget of the Museum been cut? Even more important, where will exhibitions of this relevance and calibre be exhibited and, more importantly, developed once the continual fiddling with the Powerhouse is finished? In a bid to break free from the lack of transparency of the whole process, part of the campaign to halt the dismantling and relocation of the Powerhouse Museum has released the hitherto secret business case documents provided under pressure by the NSW government to its Upper House, the Legislative Council, about the proposal by the State Government to move the museum to western Sydney. I’ve previously written that with its extensive collection of design of all kinds, from engineering to fashion to ceramics and jewellery, and with its links to industry, I always had high hopes for the Powerhouse Museum. Despite its fragmented nature, the Powerhouse was a great design museum precisely because it was also a museum of science and technology – and a museum of social history, which could place it all in a historical and social context. In many ways design is a central part of the vocabulary of our time and integrally related to so many powerful social and economic forces – creative industries, popular culture, the digital transformation of society. That the Powerhouse failed to realise its potential is a measure of a lack of strategic vision, including from successive governments which have never properly grasped the power of culture in shaping society and the need for the long-term substantial commitment to enable it. The current travails of the Powerhouse Museum are a sad reflection of this shallow lack of understanding and vision. ‘As globalism proceeds apace, the counter-balancing world of the local and regional is becoming more important, anchoring us firmly in the places where we reside and create, where culture is made and lived. A set of Canberra exhibitions built around innovation and celebrating the achievements of craft and design connects local creativity and cultural life with the larger international significance of the themes and artists involved’, The innovative power of art connects local and global – Craft ACT embracing diversity.